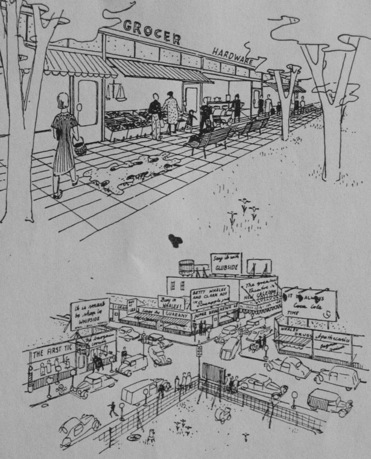 Kenneth Welch, Grand Rapids Parking Plan, 1945. Copyright: Architectural Record. 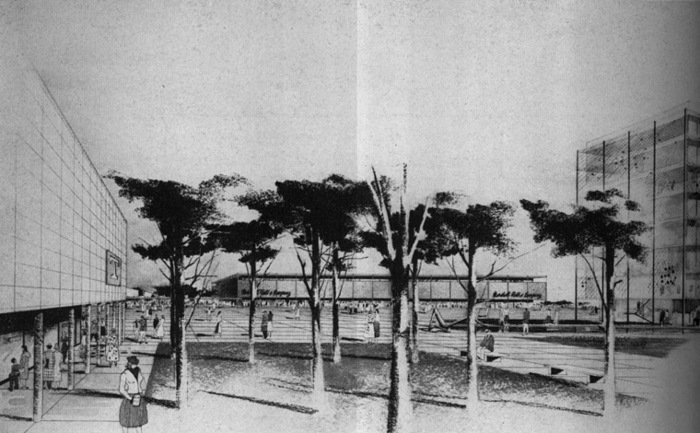 Pedestrian Modern reframes the history of modern architecture in the United States by charting its intersection with the professional representation of programs and plans for merchandising. 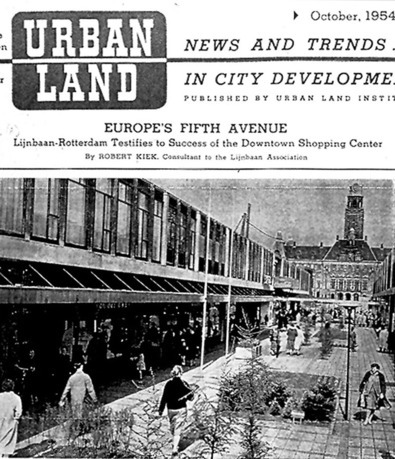 Across the middle decades of the twentieth century, shopping was described by architects and in the architectural journals as uniquely suited to the emerging normative practices and tenets of modernism. Before World War II, a store design could be modern if it demonstrated rational methods of organizing, displayed goods behind ever-larger panes of glass, and fine-tuned entry to the store from the sidewalk. 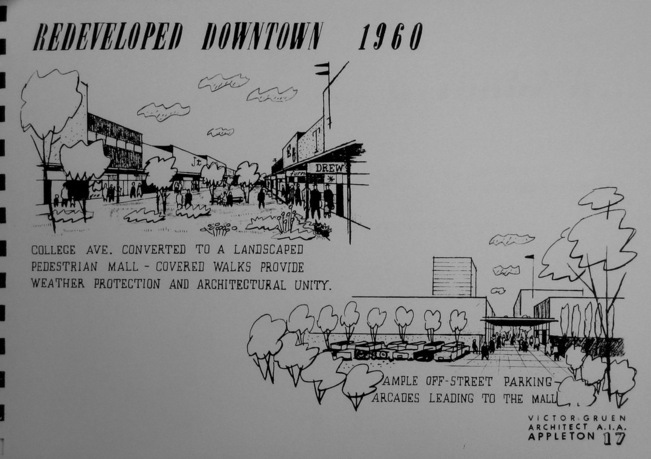 During and after the war, pedestrian-based shopping districts and shopping centers required site, transportation and neighborhood planning, complex programming, large-scale building, and even urban planning, all of which were described by designers and the architectural press through a modernist lens. 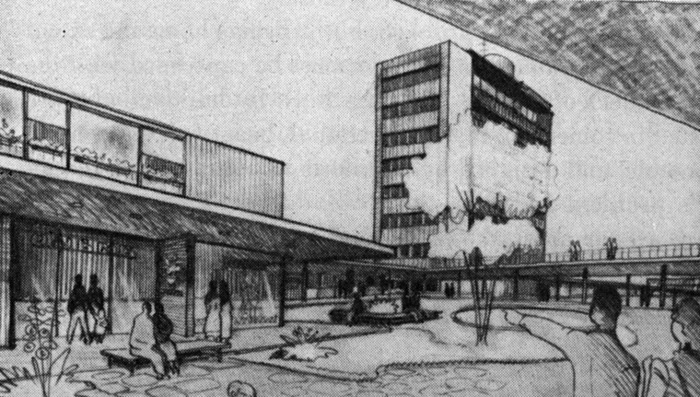 Despite the anxiety that shopping lay too close to the seductions of consumption and the pedestrian concerns of money, this book shows that merchandising was a legitimate professional avenue to test what modernist architecture could accomplish. 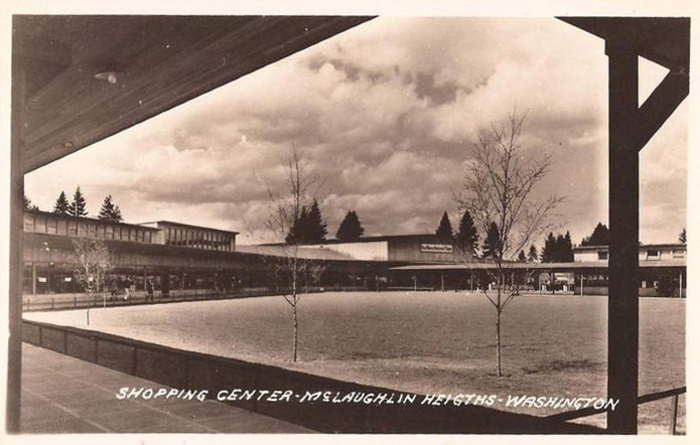 By newly situating the role of shopping within modernism, this project expands the historical understanding of modernist discourse, the social context of practice, and shows that conceptions of modernism were subject to considerable debate and reimagining. David Smiley is an assistant professor holding a joint appointment in the Architecture Department and the Urban Studies Program at Barnard and Columbia Colleges. He teaches design studios, architectural and urban history lectures, and urban studies seminars. In the Journal of Architectural Education, Perspecta, and the Journal of Urban History, among others, Smiley has written on contemporary urban and suburban issues, large-scale urban interventions, the re-use of shopping malls and the recent history of urban planning and urban design. From 1999 until 2004, he was research director of Design+Urbanism, an urban design firm that completed studies and plans for neighborhoods internationally as well as for New York City. 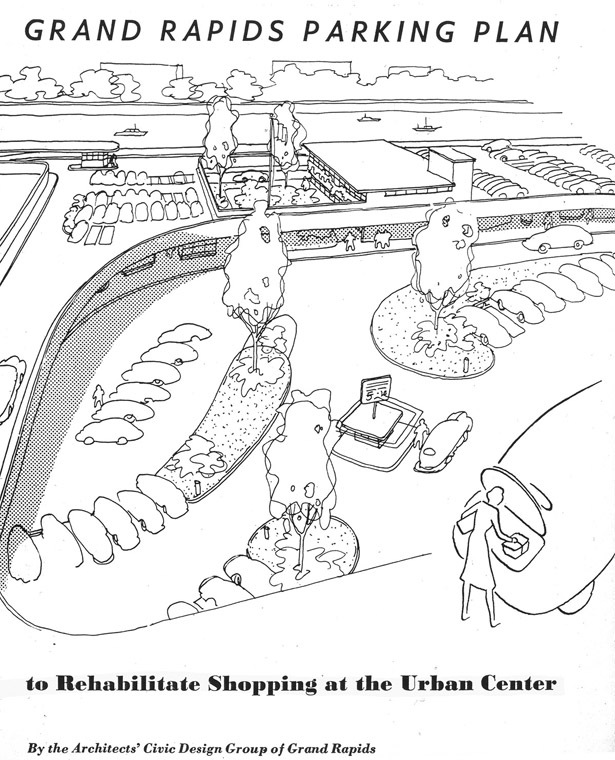 In 2002, he edited a study for the re-use of "dead malls," Redressing the Mall: Sprawl and Public Space in Suburbia, for the National Endowment for the Arts. He has taught at Yale University's School of Architecture, Washington University in St. Louis, and Texas A & M University; he is also an architect.